X-Small - $88.99 Small - $88.99 Only 2 left! Medium - $88.99 Only 7 left! Gamora, the dangerous green Marvel superhero, has quite the rap sheet. She’s stolen priceless treasures from heroes. She’s wiped entire civilizations out of existence. She’s pummeled her sister into submission on more than one occasion and she’s even caused mass destruction inside the Kyln, one of the galaxy’s most dangerous prisons. She’s even got a style so fierce, that just a mere glance at her could kill! The only thing she’s not good is dancing, but you’ve got that part covered if we help you out with the fierce look, right? 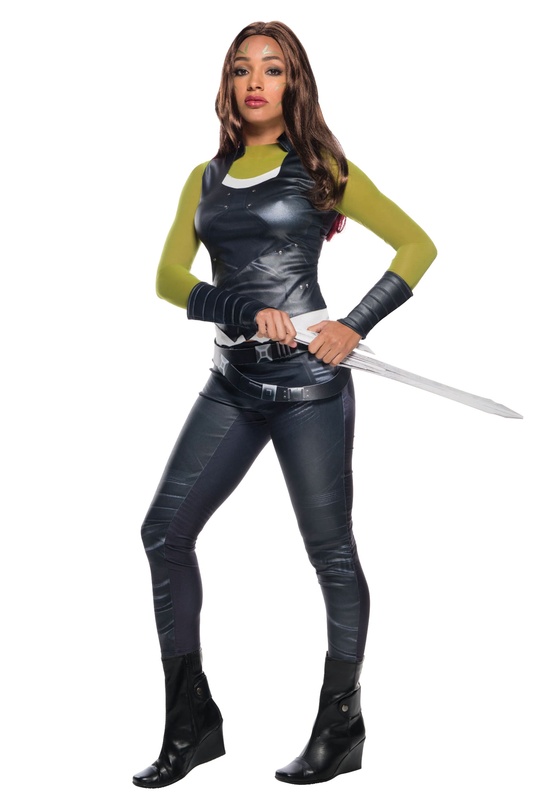 This adult Gamora costume helps you achieve a completely authentic Guardians of the Galaxy look. The costume is officially licensed from Guardians of the Galaxy Vol. 2 and it comes with everything you need to become the deadliest woman in the galaxy. The outfit comes with a faux leather top with green sleeves, a matching faux leather pair of pants, a pair of gauntlets and a belt. Once you’ve geared yourself up in this costume, you’ll be ready to do battle against Thanos himself! Well, okay. Maybe you should start with some lesser enemies, like Ronan the Accuser before you pick a fight with Thanos. Of course, if you plan on doing battle with the galaxy’s craziest baddies, then you’d better assemble a ragtag team of heroes, so check out the rest of our Guardians of the Galaxy costumes. You can even team up with Star-Lord to have an unspoken thing between you (which you should never speak about, since that’s the only way it will remain unspoken).